Michael Webb is a lucky man. An architecture and design critic, he has lived for nearly 40 years in a modernist hilltop apartment in Los Angeles, the same development where Orson Welles used to live. It is “well-planned…with abundant natural light”, surrounded by trees that give shade and privacy, and has windows “that pull in breezes from the ocean”. Two of its previous owners, Charles and Ray Eames, loved living there so much that when they moved out they wrote to its architect, Richard Neutra, to thank him. Sadly, he explains, most modern apartments are terrible. Risk-averse, profit-hungry developers conspire to produce blocks and towers packed with “claustrophobic cells [that] open off double-loaded corridors. Light and air come from one side only, and balconies are usually vestigial.” A brief survey of the finest modernist and brutalist schemes – from the Isokon building in Hampstead to Le Corbusier’s Unité d’Habitation in Marseille – is a depressing reminder of our current paucity of imagination. 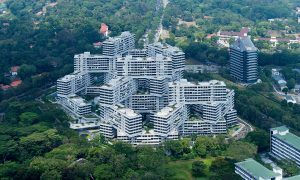 In an attempt to demonstrate the “unrealised potential” of the apartment building, Webb has gathered together 30 examples of recent developments from around the world. They range fom luxury flats to social housing; from low-rise buildings to high-rises. There aren’t as many photographs of the interiors as there might have been and while Webb has interviewed many of the architects you long to hear the voices of the residents (who are, after all, the ultimate judges of a building’s success). But it’s fascinating to see these creative responses to the deceptively simple challenge of fitting a lot of people into a small space. During the noughties, starchitects were falling over themselves to build apartments for the well-to-do. Zaha Hadid’s flats form part of the gated residential complex at CityLife, a 1km sq development in central Milan, which includes skyscrapers by Hadid, Daniel Libeskind (who also designed apartments) and Arata Isozaki, as well as a park and its own subway station. 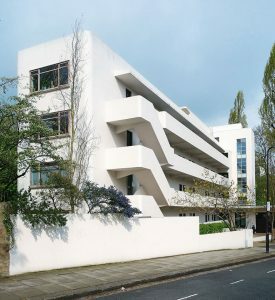 The streamlined curves of some 1930s flats (see the Isokon building) were a nod to the design of ocean-liners. 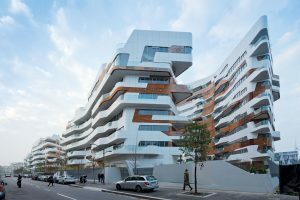 Hadid’s apartments, with their rippling façade of cedar and white enamel, have all the subtlety of a mega-yacht. 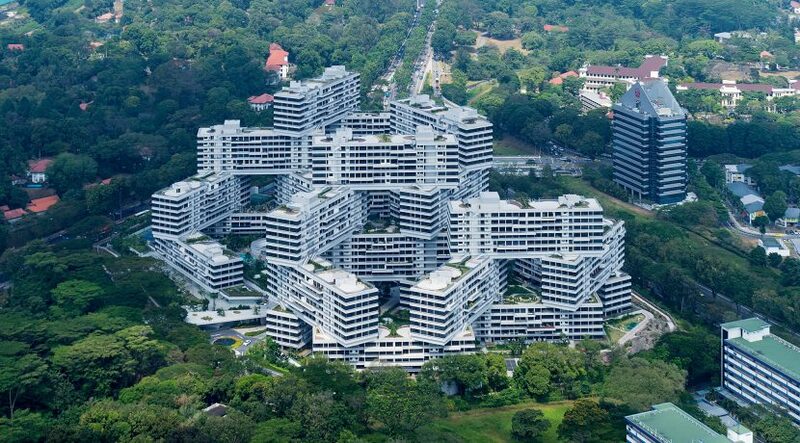 She wasn’t commissioned to design the apartment interiors (“probably just as well”, says Webb) but she did “shape the spaces”, adding even more curves for interior designers to contend with. 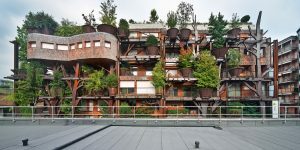 If the Swiss Family Robinson moved to Turin they would feel right at home in this green-fingered fantasy. The block incorporates 150 trees, looked after by residents with help from gardeners, who also tend the building’s communal garden. It is part of a growing trend for architects to “build” live trees into their creations. As well as being pleasing aesthetically, trees muffle noise pollution and provide shade and privacy. 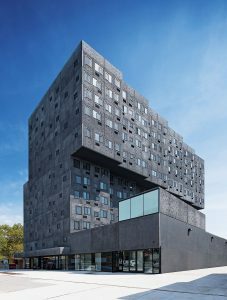 The 63 apartments, which, says Webb, “have attracted a diversity of middle-income residents”, range in size from 480 to a generous 1,720 sq ft.
“We tried not to make something merely acceptable to the poor – I find that idea quite offensive…what excited me was to create a building that was not just about housing [but rather] a new urban experience.” It was precisely David Adjaye’s excitement that convinced Broadway Housing Communities, a non-profit organisation, to commission him to build this 13-storey, mixed-use development in Harlem. Clad in dark concrete that has been ribbed to catch the light, it is dotted with square windows which playfully reference the local architecture (although some neighbouring residents have compared it to a prison). As well as 124 flats – 70% are for people earning less than half the average wage and 25 are for homeless people – the building contains a children’s education centre, a children’s museum and workshops where residents are encouraged to make their own art. 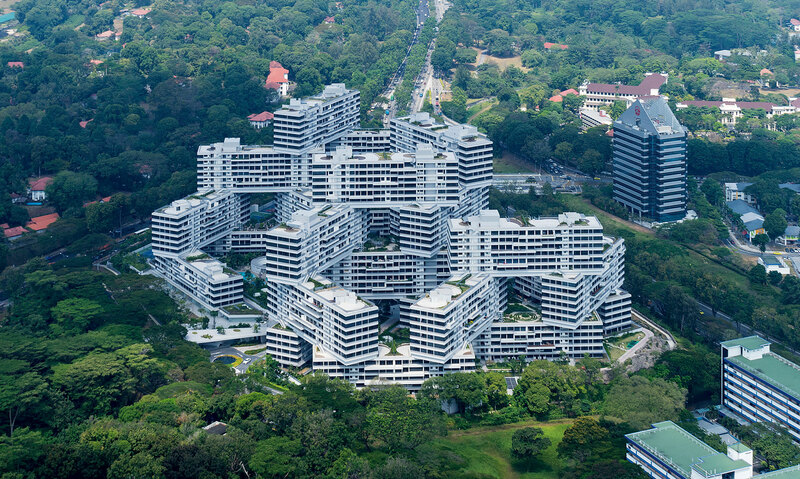 It’s disappointing that the flats don’t have balconies and that most are single-aspect, with windows at just one end. It’s also a shame – especially given the family-focussed public areas – that there are so few three-bedroom flats (each floor contains only one, compared with five studio apartments). But architects have to work within tight constraints, both financially and in terms of the units they are asked to provide. One of the biggest objections people have had to living in flats is the lack of privacy. This is even more of a problem now, with the ubiquitous floor-to-ceiling windows found in modern developments. 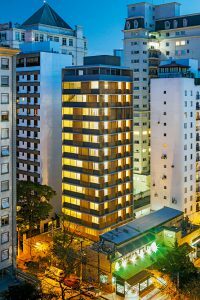 The architects of this tower block in Sao Paulo have devised an ingenious, and beautiful, solution. Shutters made from perforated freijo wood can be slid and folded across the windows, shielding residents from nosy onlookers and providing shade, as well as adding an ever-changing pattern to the concrete façade. If only the developers of the London flats that are overlooked by the viewing gallery at Tate Modern’s new extension, the Switch House, had been so imaginative. All rights reserved to the initial publisher for 1843 magazine.